I have been creating a new presentation today, and created the slide above to show four leading thinkers on dialogue. David Bohm was one of the great physicists of the twentieth century, but who was also a great philosopher who shared his thoughts on dialogue, creativity and consciousness, and how these related to the societal problems we are having in the world today. Henri Bortoft studied the problem of wholeness in quantum physics as a postgraduate student under Bohm in the 1950s. 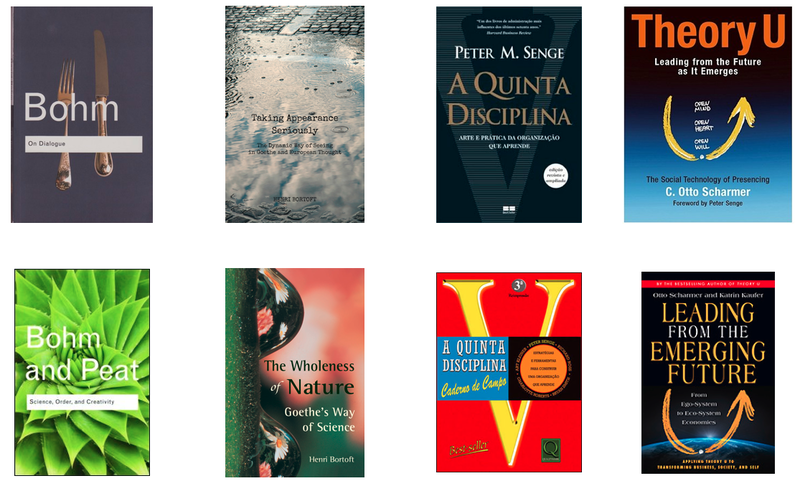 Bohm has greatly influenced business thinker Peter Senge, a person I greatly admire for his work on systems thinking, mental models and the evolution of businesses as learning organisations. Later in his career Henri would come to study the scientific works of Goethe (1749 – 1832) and his work would expand to cover the study of wholeness in phenomenology and hermeneutics. In the 1970s Henri challenged those who advocated General Systems Thinking, and his work would come to influence both Senge and also Otto Scharmer, influence which can be seen in their understanding of the whole, and how the parts in a system come to presence in the whole. (See for example Senge’s The Fifth Discipline, and Scharmer’s Theory U and recently published Leading from the Emerging Future). It may seem strange if you have not been introduced to this lineage of thinking, but we in organisational and business life can learn a huge amount by studying Bohm and Bortoft. It is not the science per se which we need to learn, but the mode of thinking, the way of knowing the world, the creativity in achieving new insights, and the ability to jettison out-of-date mental models which no longer serve us. It is one thing to be philosophical, but there is no point in being a philosopher if you can not help people in some way, and for that reason Peter Senge and colleagues wrote The Fifth Discipline Fieldbook which is a guide to help those in business put the insights from The Fifth Discipline into practice. This is a fantastic book full of case studies, exercises and tools for people to help their teams, departments and businesses become learning organisations, and it is a book I can strongly recommend. 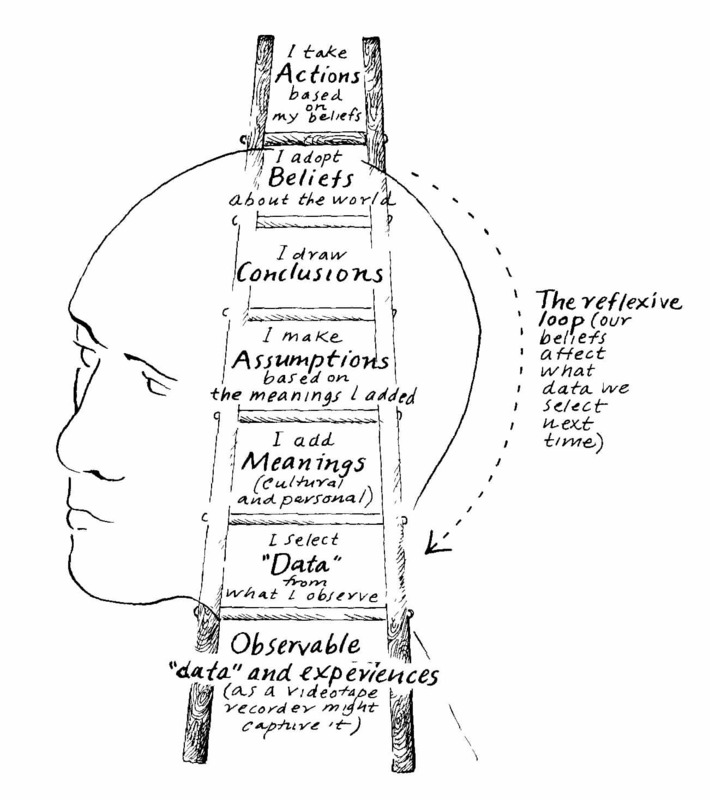 The section on mental models was of particular interest to me, especially as this is a subject I teach and consult in, and I was drawn to the diagram of The Ladder of Interference, in the section on self-generating beliefs. (Reference: The Fifth Discipline Fieldbook p242). Senge and his colleagues, on the other hand, posit a whole series of separations here, each of which is what Henri would describe as a ‘finished object’. The ladder begins with objectified ‘data and experiences’ which are conceived as separate from the ‘observer’ who selects from them. Then the observer ‘adds’ meanings – which, again, are conceived as already complete and separate from the data (almost as if the observer were a chef, throwing onions and carrots together). And so it goes on. None of this makes any sense according to ‘the phenomenology of the event of understanding’ as Henri draws our attention to it. What it is, instead, is the application of the kind of management thinking that attempts to break a process into a series of sub-processes, where each element is objectified and commodified, to the experience of thinking. I certainly think it is good to question this, which is interesting and clear but still seems like a very dualistic model! I don’t like the word “Data” at the best of times, I question the lack of an active “I” at the bottom rung and I have a lot of trouble with the step “I add meaning” – is meaning solely added by the observer or is some level of meaning present in the experience waiting (as it were) for us to identify it? This is an extremely powerful summary of just one aspect of Henri’s work in this area. For me, studying Henri shows me just how important dialogue is, and how it is through dialogue we can gain a much deeper understanding of that we are discussing. Dialogue is an art and a skill, and has to be nurtured over time.